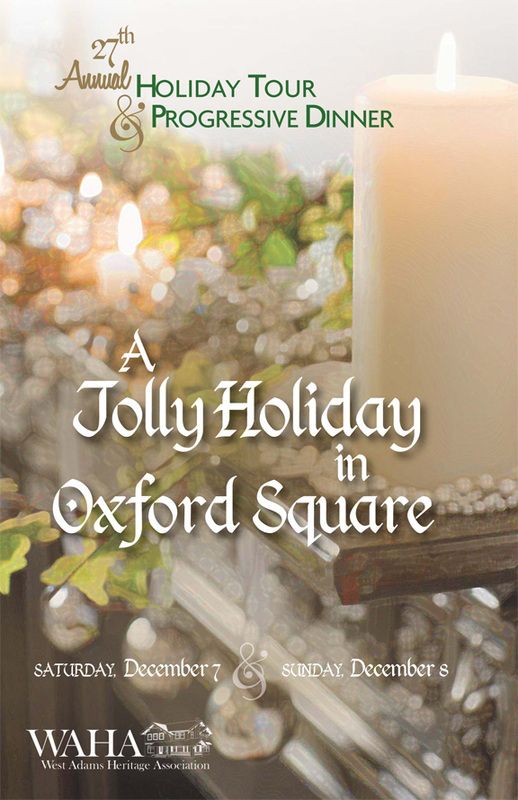 WAHA’s most popular tour took place on December 7 & 8, 2013 celebrating A Jolly Holiday in Oxford Square. To all of you that attended this year's tour, your support of our non-profit organization is very much appreciated. Celebrate Los Angeles at LA Heritage Day! 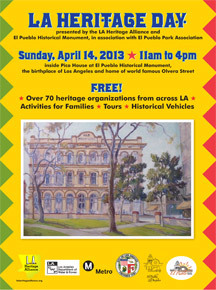 On Sunday, April 14, 2013, from 11am to 4pm the L.A. Heritage Alliance will host its Fourth Annual L.A. Heritage Day to share Los Angeles and Southern California’s history through tours, five museums, children’s activities, presentations, giveaways, food, and other activities. The entire event and all activities are free and will take place at the birthplace of Los Angeles and adjacent to world-famous Olvera Street, making for a full day of free history, fun, and entertainment. The Holiday Tour & Progressive Dinner was a great success - another sold-out event! 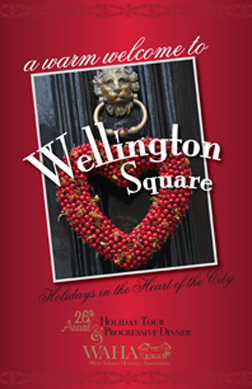 The West Adams Heritage Association extends to you A Warm Welcome to Wellington Square . This gracious neighborhood is a vivid representation of the rapid growth that Los Angeles experienced during the 1920s in the years following the end of "The Great War." There are a few examples of the wonderful Craftsman homes that were typical of nearby neighborhoods constructed prior to WWI, but most of the homes that grace the broad streets of Wellington Square reflect the eclectic styles of a vibrant young city, with Spanish, Tudor, Norman, and other "Revival" styles throughout the neighborhood. Sunday, August 19th, 2:00 - 5:00 p.m. Please bring something delicious to share with your WAHA neighbors and friends. And contact Suzie Henderson, if you'd like to offer some assistance in putting on this event. 11:30 a.m. to 3 p.m. 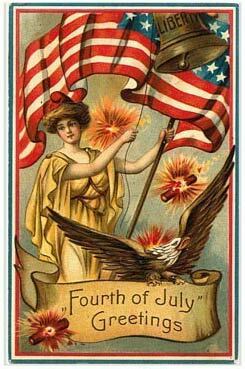 Please don your summer whites or patriotic attire, and join WAHA at our annual 4th of July picnic. This is the event where we meet, greet & welcome the more than 50 new households that have joined the WAHA family over this past year. A century ago, Adams Boulevard was Los Angeles’ Street of Dreams – the main artery of a “Bon Ton District” that included Chester Place, St. James Park and the Belgravia Tract, home to some of the City’s finest residences. For this year’s Annual Spring Homes and Architecture Tour, WAHA invites you to stroll these pathways to yesteryear. 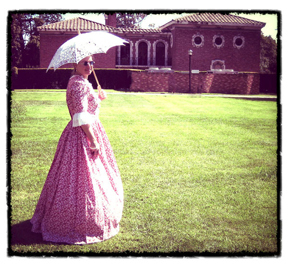 This self-guided walking tour will open the doors to a collection of historic buildings that evoke the times and memories of the late 19th century in Los Angeles. 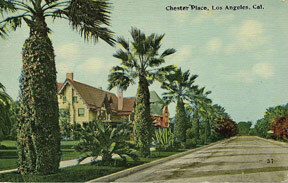 Tour visitors may also ramble through the grounds of Chester Place, L.A.’s oldest gated community. Developed in 1899 as an exclusive enclave, these historic mansions are now home to Mount St. Mary’s College. 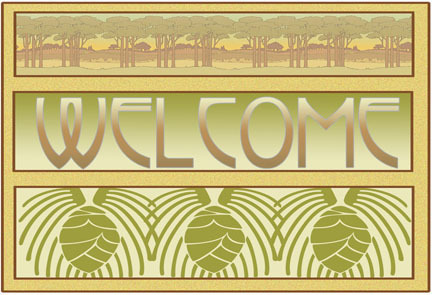 Sunday, May 6, 2012 11:00 a.m. - 2:00 p.m. The Tour Was a Great Success -- We Sold Out!